← Gowanus shuffleboard hotspot features both competition and leisure. Enjoy the Royal Palms!! 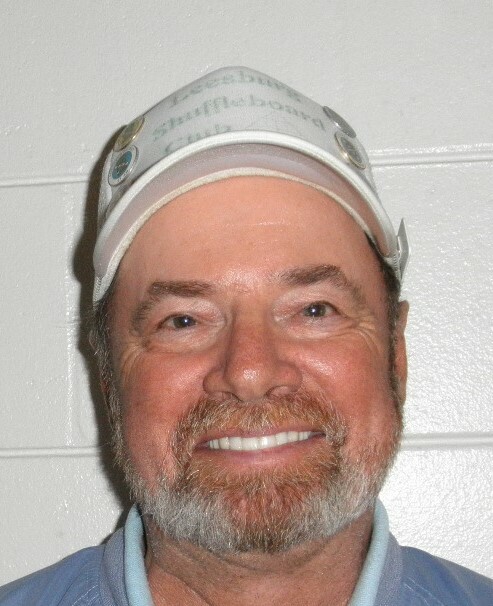 Al Dronsfield Speaks: Good morning to all, on the split side, a report from the Northern District side of the FSA State tournament held at Tavares. A turn out of 16 Ladies teams and 21 Men’s teams saw some pretty good battles as well as milestones reached. As reported, Sue McLaughlin playing along side her faithful partner Marion Lohbusch made her 200 FSA Hall of Fame points to join many including northern district friend and partner Allen Dronsfield and heading towards induction into the HOF Jan. 14th. 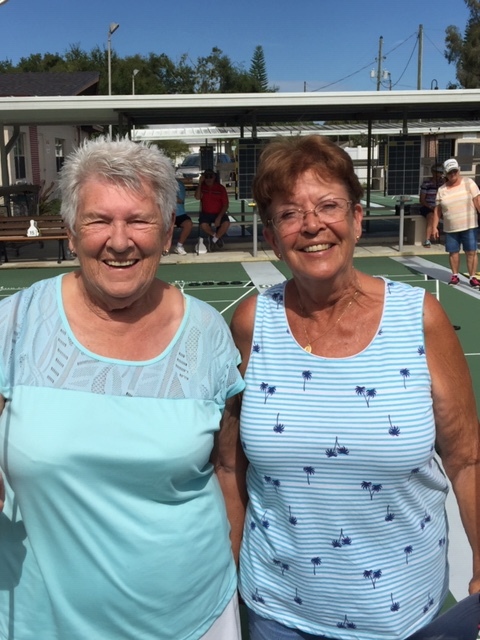 Local Ladies Lorraine Layton and Cheryl Cole took care of things at their home club by taking 1st in the Main. Earl Ball partnered up with Walt Bartels, not Henry, in this one and won it all. Things started off real slow on Monday as overnight rains made courts very difficult to play on, muscle and brawn was in order to get it done early. As the sun came up and a very gentle breeze the courts dried and picked up speed. From the numbers it would appear that the northern district protected their home turf reasonably well. 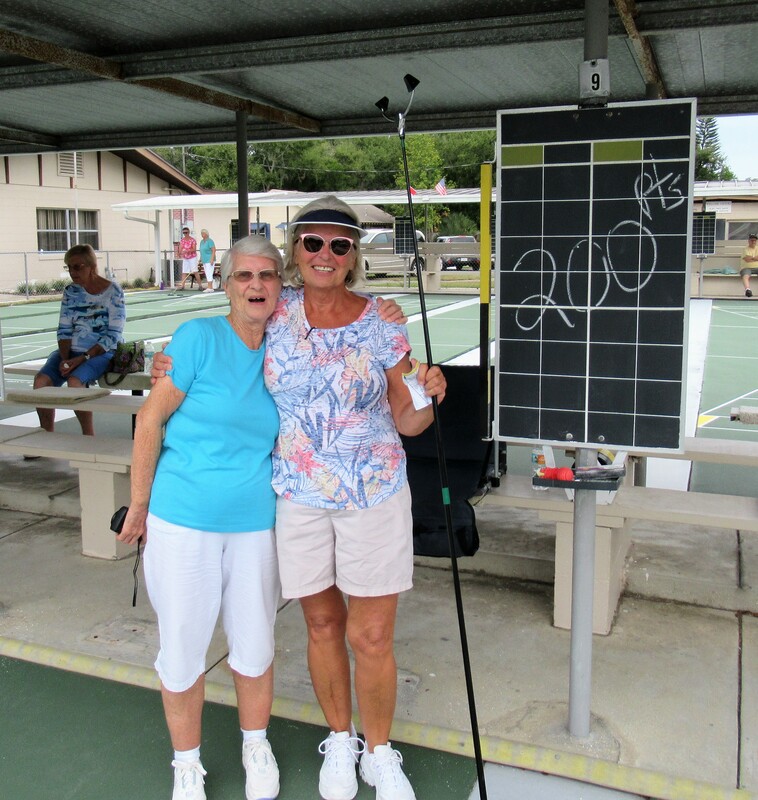 Edie and Judith did a great job dishing out the belly buster hot dogs and Rick and members getting the courts ready to go. This was the first of two state tournaments to be held at Tavares this year; this was originally the Deland state event. City representatives from Parks and Recreation, Tammy and Scott showed up for the opening ceremonies with enlightening news. 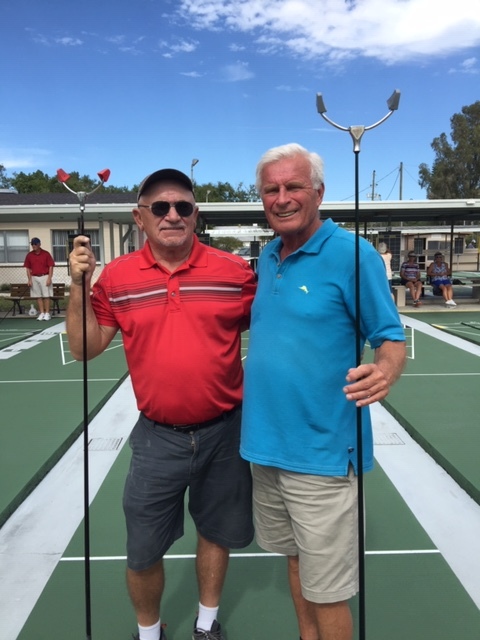 The City of Tavares is planning to do alot of upgrading of some of their facilities and the shuffleboard club in the mix of it. They’ve already replaced many of the old flat benches with very nice benches with backrests and armrests. They have many other plans for improvement including some sort of roofing being proposed. Thursday and Friday of this week the northern district will hold its Men’s Dbls./Ladies Dbls. at the Leesburg club. Freshly Nella Sealed courts and newly resurfaced disc by Walt Bartels will make play alot easier this week. Lunch will be available!! On the menu will be home made pulled pork sandwiches. From the state side, another split, many will travel to Tropical Haven in Melbourne for the Mixed Dbls. tournament and Bradenton for the Men’ and Ladies Dbls. next week. Sponsors from the Tavares tournament were Edward Jones and Denny Len Buick, Gmc..
Al I like the way you tell a story; very interesting and you cover so many things the rest of us don’t.